The UK could save up to £8bn a year by using electricity better, the government's infrastructure advisers say. Experts believe it is the first step to a full-scale "Internet of Energy", with web-enabled home appliances like freezers and washing machines linked to the grid. Here's how it would work: At a time of peak demand, an energy firm's computer will contact your smart freezer to ask if power can be switched off for a few minutes to allow your neighbour to use some of the energy to cook dinner. Your well-insulated freezer will stay cold without electricity for a while, so it will agree to power down. You will be rewarded with a credit on your energy bill. Multiplied across thousands of homes, smart energy means the grid will need fewer power stations than it was planning to meet peak demand. The system is already operating with firms like the hotel chain Marriott, which allows its aircon systems to be switched off to save power when electricity demand peaks. The aircon stays cool because of the volume of cold water in it, so guests don't notice. On the other hand, at times the grid is awash with energy - at night, or when it's very windy or sunny. In these times of energy plenty, a computer will contact your web-enabled washing machine or dishwasher to ask if they want to turn on to benefit from cheap power. This is known as demand flexibility - and the infrastructure commission says it must be supported by government. Lord Adonis, chairman of the commission, said: "Our existing power stations are closing down and their replacements will be radically different as we de-carbonise supply to reduce emissions. "This represents an enormous challenge, but it leaves the UK uniquely placed to benefit from exciting innovations set to transform the global electricity market. "The UK can lead the world in harnessing these innovations. We do not call for new subsidies or significant public spending, but rather a level playing field through fairer regulation and a better managed network to allow these exciting new technologies to compete. "If we get this right, a Smart Power Revolution could save consumers £8bn a year." The commission wants to see more ideas for storing energy - like using liquid air or pumped hydro power. The commission's report will be welcomed by many in the energy industry. 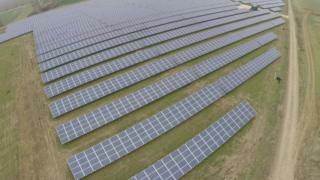 The head of the World Energy Council, Christophe Frei, told BBC News there would be two huge advances in energy in the 21st Century: solar power - and the internet. "Everyone knows about solar power," he said. "But people haven't yet grasped the transformative potential of information systems on the internet to maximize the efficient use of electricity." The new flexible systems adopt the approach laid out by the technology guru Amory Lovins decades ago. He proposed that a megawatt of energy saved - which he christened a NEGAwatt - should be rewarded just as highly as the power generated. Academics warn that the flexible energy revolution must be enabled because with the future need for cars powered by electricity and homes heated by electricity to save carbon emissions, the existing grid won't cope unless there is change. Professor Phil Taylor from Newcastle University said: "If you unravelled the National Grid it would stretch to the moon and back. We can't afford to renew it even if we wanted to." He said he welcomed the report, which may accelerate moves already in the system. The government has a working group on flexible demand, and the regulator Ofgem has forced electricity providers to show how they will roll out smart energy. "This report is progressive," he said. "It's the right way to go - delivering savings through flexibility rather than more infrastructure." A report for the commission by Goran Strbac from Imperial College concluded that if there's enough flexibility in the system, it can prove cheaper than nuclear power or carbon capture and storage technology.